29th Street Wharf is a freelance, “box theatre-style” layout representing a West Coast USA city sea-front railroad, although it could just as easily be Great Lakes/Chicago area. 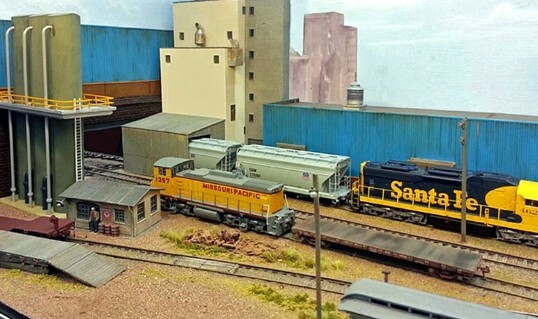 The exhibit is continually being evolved, to depict typical, gradual railroad and associated industry developments over a period of time (1970s to late 1990s). The primary objective is to both retain some heritage and strike a balance between old, run down, and new. Industrial and commercial structures require hopper and box-car handling. A small servicing area and a timber landing/pier are featured, together with a stone/aggregate loading terminal, fed by a conveyor system, to support 2 harbour-side tracks and a river barge loading facility. Most structures are based on modified Cornerstone kits and all have been weathered to reflect gradual wear and tear around railroad operations. Whilst rolling stock is generally in the period 1970’s to 1990’s, later era stock can also be seen. Santa Fe, Southern Pacific, and Union Pacific are predominant but other railroads (e.g. CSX, Norfolk Southern) have been given operating license. Operation is by digital command control (DCC), using a Lenz system. Many locomotives (Atlas, Athearn Genesis, Kato) are sound-enabled. All track has been recently upgraded to code 83, with remote point control executed using Tortoise and Cobalt motors. Auch Ae is a 4mm scale Scottish Region locomotive shed based in the 1960’s. It is very much work in progress but showing it in a part built state gives the opportunity to see how a layout is built. All the track work has been laid using Peco code 75 track and wired for dcc operation. Buildings on the layout are scratch built and are based on prototypes in Scotland. The layout will be operated with a mixture of steam and diesel locomotives with many featuring working sound. Until recently when travelling either North or East from Bristol Temple Meads you could view from the train window the English, Welsh and Scottish Railways deport of Barton Hill. This is now hidden by more recent buildings, but just a few years ago it was a Rail Express Services Depot hosting a range of red liveried postal rolling stock. This model is intended to give an impression of that depot. Baseboard construction is of plywood, Peco track is laid on a cork base and electric point motors are a mixture of Peco and Seep. Railfreight wagons are fitted with Peco uncouplers to enable "hands off" operation by means of strategically placed electro magnets. Some modelers license is used so that I can run what I like to enable me to play trains. It is the 1960’s on British Railway’s Southern Region. Normal main line steam traction is about to end as the new diesel era and the continual spread of electric traction takes hold. Dagnell End was conceived as a fictitious station on the Hounslow loop in south-west London. The line is on the former London and South Western Railway line out of their London Waterloo terminus and our station is located somewhere close to where the real station of Brentford is. The layout was planned as a challenge in building an urban landscape to make a change from building layouts with green fields. All buildings are scratch built with many based on London prototypes, which have been photographed on a number of field visits by club members. The basic structures of the buildings are made from thick card, which were covered with plasticard to replicate stone or brick finishes. The structures have then been painted and weathered to represent the prototypes from the area. To add interest to the layout though not strictly correct for the part of London modelled there is an underground tube line across the front of the layout. The Underground trains are modified and motorised EFE models, which work on an automatic cycle. Main line trains represent the variety that could be seen on the south-west section of the Southern Region in the 1960’s. Virtually all of the southern electric units have been scratch built. Control of the mainline trains uses the NCE DCC system. 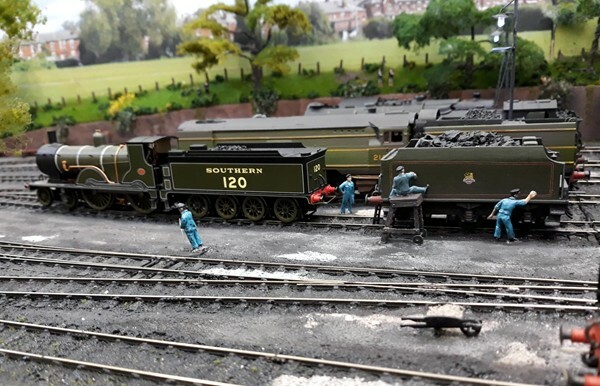 I used to do my train spotting at Feltham Shed in the 1950’s and 1960’s and later I was a fireman there in 1963 till the end of steam traction there, so I decided to build Feltham Road MPD steam locomotive depot. It is set in the 1950’s to 1967 the end of steam on the Southern Region. The Dapol turntable is operated by a stepper motor with the electrics from Model Electronics Railway Group (MERG). It is operated by MERG DCC control system connected to a Raspberry PI (mini computer) with JMRI, so it is controlled by my mobile phone or iPod. The points are operated by servo motors with MERG servo boards and these are not DCC operated but using toggle switches with frog polarity from the switches. The track work is hand built with C&L components but not their sleepers. I cut sleepers from 0.8mm thick plywood on my band saw. The buildings are all scratch built. The track plan was drawn on templot (CAD program) which took some mastering to understand how it works. The shed is the same design as Feltham MPD, the difference being that it is an end shed whereas the real Feltham shed had six through roads. To make things fit the repair road is on the right had side whereas on the prototype it was on the left. The ash disposal pit is side lit up using the MERG twinkling lights kits and the yard lamps are scratch built. 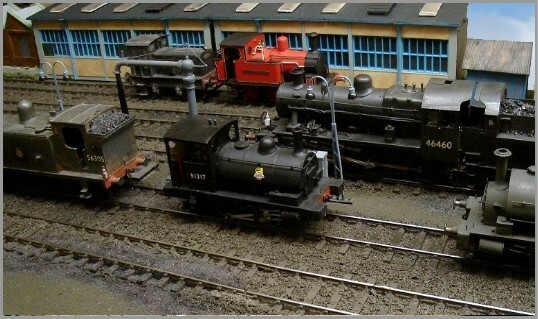 The layout is set in North Staffordshire in the period between the late 1970’s and the early 1980’s. It depicts a cross country route with a small suburban station and yard. The layout is built on a 4ft by 2ft board. The layout shows you don’t need a lot of space to construct a model railway in this scale which features a continuous run and allows for shunting in the yard. 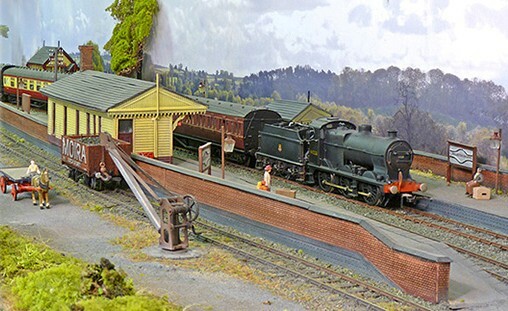 The layout was featured in the October 2018 edition of Railway Modeller. Motley is a minimum space 7mm/ft 0 Gauge layout occupying a 10ft x 2ft space upon which the main scenery is the fleet of locomotives. My collection of locomotives was once described as a ‘motley’ one, so it seemed the natural thing to do, when constructing a layout upon which to display them, to call it ‘Motley’ ! We assume that the seaside town of Motley has a year-round local passenger traffic and freight trains to and from the harbour. There is a reasonable harbour and private freight railway served by a fleet of small industrial locomotives. During the summer months there are special trains from all over the country bringing holidaymakers and day trippers. All these engines need somewhere to rest until the time of their return working. The sub-shed seen here at Motley provides that space. This is not a large motive power depot, just somewhere to park locomotives between duties and perhaps replenish the tenders or clean clinker from the firebars. Upwards of a dozen engines can be seen ‘on shed’ at any given time and they will be seen going on and off shed, and being repositioned to allow others to move. Most of the locomotives and other scenic items have been hand built from kits, and I am grateful to Keith Blake, Aiden Houlders and Peter Whyborn for building these for me, and to Andy Wilkie who assists with the operation of the layout. This O gauge layout is a recreation, with some differences, of my original North Foreland that was built in 1996 and retired from the exhibition circuit in 2003. The layout is set in North east coast of Kent in the days of the Southern Railway in 1947, just prior to Nationalization. 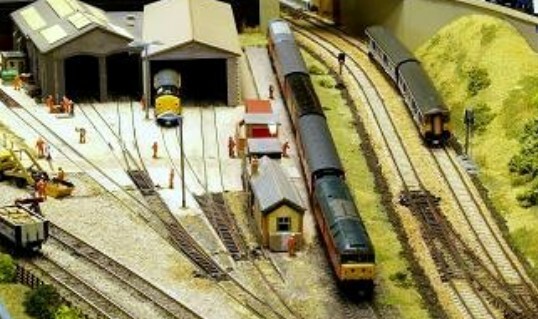 Whilst the location is an actual place, although being feasible, the railway is entirely fictional. It is imaged that the main line is to Charring Cross and Cannon Street stations, in London via Ramsgate, Canterbury or Dover, Ashford and Tonbridge, whilst another line swings north to Margate, Faversham, Chatham and London Victoria, a triangular junction with the existing Margate to Ramsgate line being located beyond the bridge that forms the scenic break. The buildings are typical structures of the Southern Railway or the former constituent South East and Chatham Railway. A small locomotive shed is provided for the station pilot. The yard is a serving point for main line engines which can be turned on the 6o’ turntable, locomotives requiring anything more than basic turnaround serving have to proceed light engine to the main depot at Ramsgate. The Lenz DCC system is used to control locomotives, points and signals. Points are operated by Hoffman motors mounted under the baseboard and signals by servos controlled using Mega Points controllers from the Lenz system. This layout began as a test tract for newly built locomotives and rolling stock. It was suggested it was developed into a scenic cameo layout which is how it became Queens Street Yard. This required the construction of a purpose built fiddle yard, backscenes, lighting and a fully functioning power box instead of the temporary wiring used in the workshop. The layout timescale is the pre grouping period as such a wide variety of locomotives and rolling stock have been built in many different liveries. 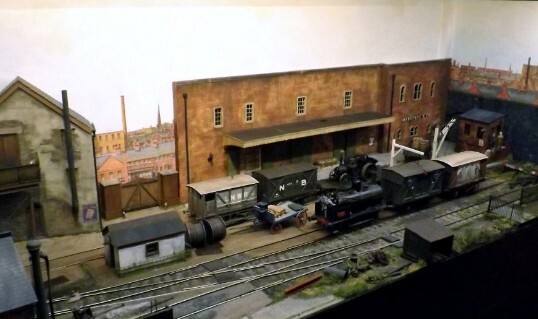 The layout is modelled as a typical Victorian small back street yard not aligned to a particular railway company thus allowing a variety of stock to run. Most stock is however from the London North Western Railway with the occasional Great Eastern Railway interloper. All the stock is now fitted with an adoption of the Dingham coupling instead of the traditional three links for ease of operation at shows. The scenery is constructed from card, foamboard or plasticard faced with embossed plastic sheet to give the brick or stone textures. Some of the detail are from cast kits as are the vehicles and figures. The small office and the engine shed were constructed from the new type of laser cut card kits and have proved very good and easy to assemble. The locomotives and rolling stock are all built from brass and plastic kits modified where necessary to improve the detail. All are spray painted and weathered to suit. The two turnouts are hand built and operated manually by slide switches connected to the track by brass rodding. Most of the plain track is PECO but some is handbuilt. As a test track everything was made of items already in the spares box so is a real hotch potch including the wiring. This was laid across the surface of the board so is consequently now buried under the scenery which is not ideal. Based on an actual station opened in 1894 by the North Staffordshire Railway Company to serve the village of Rolleston the layout represents in 4mm scale as accurately as possible the location as it would have appeared in the summer prior to its closure in January 1949. Built to EM gauge track standards, rolling stock is generally kit built or in some cases assembled from scratch using what ever reference survives. Although set in the British Railways era, trains from earlier LMS times do appear as little changed to the station infrastructure during the life span. After the line itself closed in 1968 the track bead eventually between Rolleston and Streton became a footpath entitled the “Jimmy Nature Trail”, it took its name from the locale passenger train that served the route known affectionately as the Tutbury Jinny. This layout has become the procurator of a community project to preserve the remains of the station that have become a focal point for those walking along the Jimny Nature Trail. We welcome Kevin Cartwright a long term supporter of our exhibition. 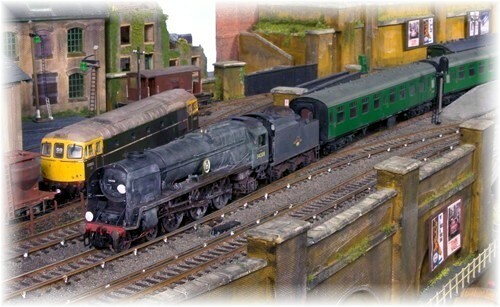 Kevin was last exhibiting at a Redditch show in 2015 with his Brixham Bay layout a 2mm model of the real station of that name. Ventnor West is something totally different this time in 7mm scale. What you see here today is the product of almost 20 years of research and the actual building of the layout, taking into account also that sometimes life gets in the way!! The buildings, rolling stock, and road vehicles are all scratch built. The buildings are all faithful copies of the prototypes , some of which still exist today. I have spent a lot of time on the site of this station photographing and drawing the buildings. My wife's cousin lives almost opposite the station building which was very useful when I was researching this project. Like previous layouts I have built I have painted the back scenes. The layout is DCC controlled with sound in the locomotives. 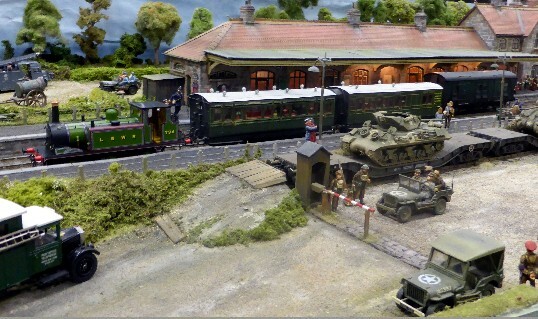 The layout is set in the 1940’s during the Second World War when much of the south coast of England including the Isle of Wight was given over to the preparations for the D day landings on the 6th June 1944.